It’s a mother/daughters thing. 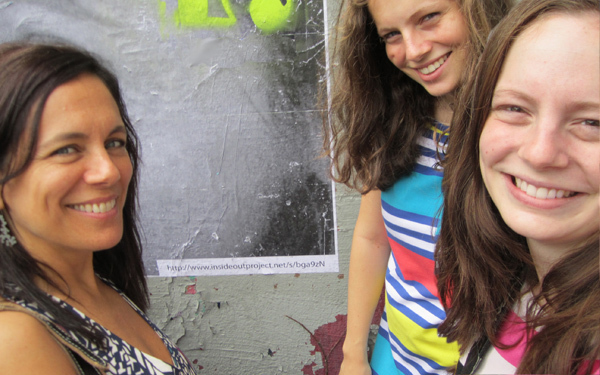 The three of us share a passion for all things design, art, fashion, and pop culture related. Debbie is a graphic designer in NYC and the voice of the blog. Daniela is a third year industrial design student at RISD and designer of the super-fab EARonic iPhone cases. Emma focuses on the sciences in her last year at Brown, as well as having a keen eye for photography and a weakness for fashion and design blogs. This is where we share our links and finds. One of the ways we stay connected. Welcome to our CollabCubed. If you’d like to get in touch, drop us a note: hi@collabcubed.com. You can also follow us on Facebook and Twitter. And, hey, check out our shop! This is such a novel idea, and much better than keeping in touch through Facebook. It seems like the perfect means for all of you to share in your common interest, and judging by the first post I like what you are all sharing. I’ll definitely be stopping by again to see what you come up with! Love what you are doing. We bought mother-daughter iphones last April, but this is more fun than that! very sweet idea! I like it a lot! Excellent! Lots of new art! Great design! Great portal to new ideas, art and design! Lots of info!! Love it! Absolutely wonderful blog. Great choices, perfect presentation. What a trio you are. Thank you. Nice to see a family that all has common interests and gets along so well. Best of luck to all with your various arts, fashion and science studies. There is nothing like when family members share the same passion! You three look great! I’ve just found you blog and noticed you had featured my art practice. Thank you for that! http://www.andrewbaines.com I’d be happy to send you my latest photos. Thank you for featuring Aqua Dice on your blog. I like what you three see in the world… please keep syncing and finding! Love your blog and all the profiles of the artists – superb to come across all these different works and inspirational creative people. The way you curate their work also shows how much you love contemporary ideas. + The fact that you’re all such a connected team in real life – that’s wonderful. My two girls are creative souls but co-blogging with their mum – that would make them a bit scared…. Nice blog. Congratulations. Could you please identify the photographer of the ‘Glowing Train’ picture? We love what you guys are doing here, really nice and always exciting to see what and who you find next! Hi! I found your page off of Emma’s final English project I read in class. I just want to say this is a great website! Once in a while i visit this wonderful site, it’s a shame there haven’t been any more updates. I hope to see some new stuff!